The Post Rock Scenic Byway is an 18 mile route that winds north and south through the Smoky Hills along K-232 in Ellsworth, Lincoln and Russell Counties in north central Kansas. K-232 is a two-lane asphalt surfaced road. 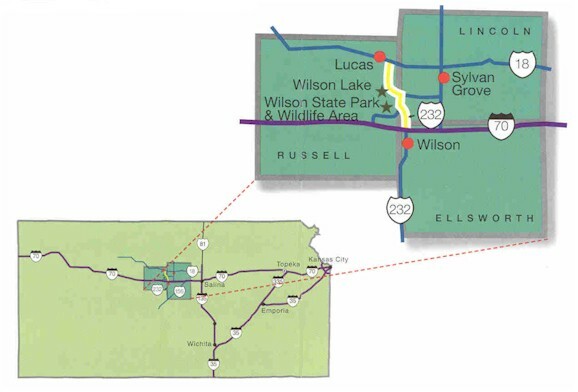 The byway connects I-70 on the south with K-18 on the north and links the communities of Wilson (Ellsworth County) and Lucas (Russell County). This byway is named for the unique native limestone rocks used for fenceposts, homes and out buildingsin the area.Along the byway you will discover 4 faces carved into the limestone fenceposts. The faces were carved by California Artist Fred Whitman and are of Lucas residents. Download the brochure for the Post Rock Scenic Byway by clicking here.